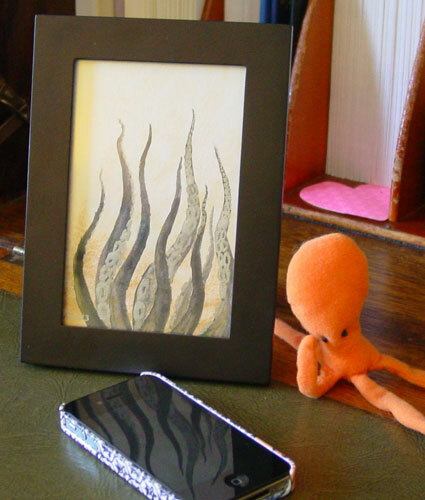 Something new for the tentacles today! I used the same metallic watercolors from yesterday’s Gold Spirals, though I painted the background on this a while ago, so they weren’t actually sharing a palette. 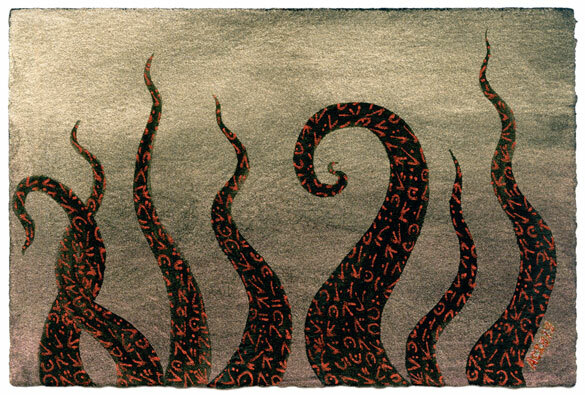 Then tentacles as usual in an opaque Japanese greenish black, and finally the runes borrowed from The Stars Are Right series crawling in shining red up the surface of each, wrapping around and writhing right along with them. I had originally considered doing the runes in green, but I decided the dull glow of red glitter pen would work better for this painting. 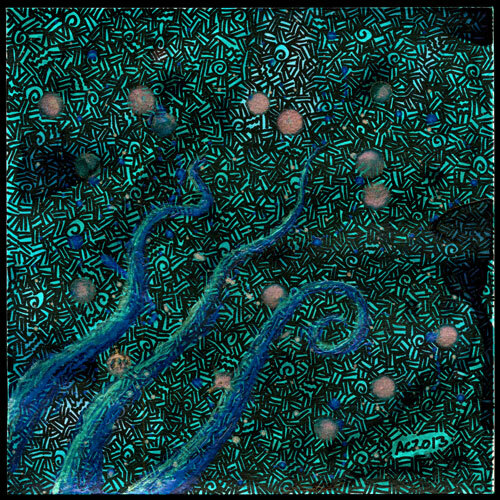 Tentacle Deeps 46, 6″x4″ Japanese and metallic watercolor and glitter gel pen on Arches cover black paper. 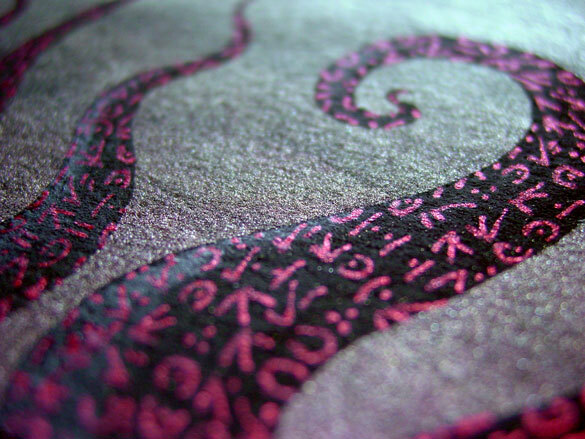 Above, you can see the way the runes curve and writhe with the tentacles, against the background that fades upward from rose to lemon gold. Below, you can see it tucked safely into a frame where it won’t harm anyone. Just don’t look too closely at the runes if you want to keep all of your sanity intact. 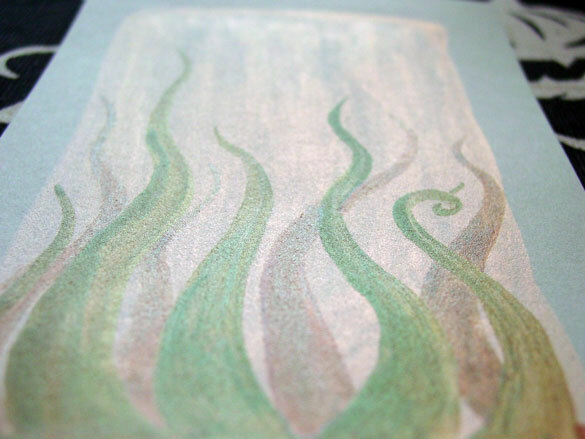 I wanted to see what the lovely bronze-green paint from last week’s tentacles would look like on a dark background, and this time it was the green that shone through, and the bronze color can only be seen at certain angles. 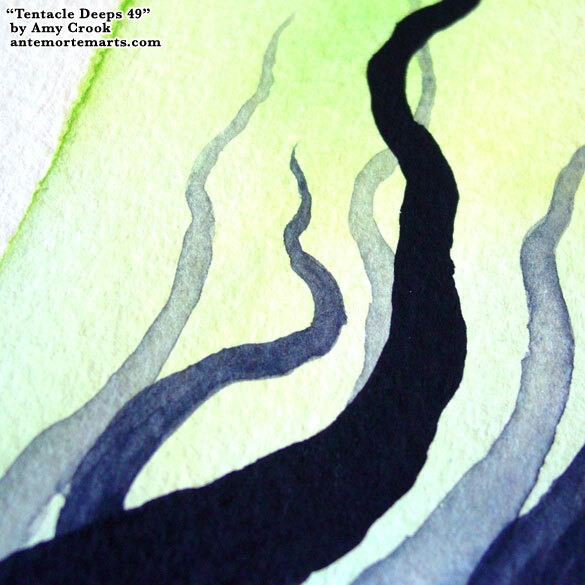 Actually these tentacles are a bit ectoplasmic to me, Ghostly and half absorbed in each other where they touch, as though reaching up from a pool of ooze to try to catch whatever lies tantalizingly out of reach. 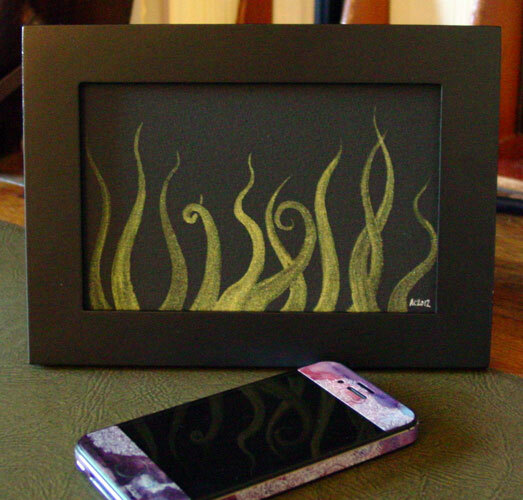 Tentacle Deeps 45, 6″x4″ duochrome watercolor on Arches cover black paper with white gel pen signature. 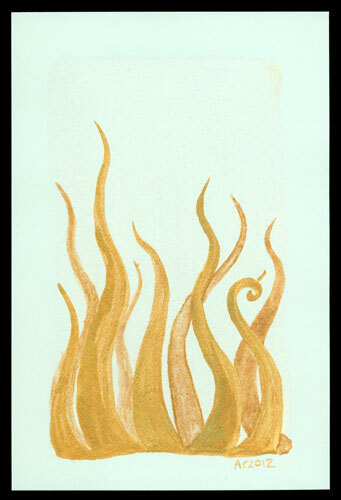 Above, you can see the color gamut from green to bronze, and the shift between them as the paper falls away from the sunlight. 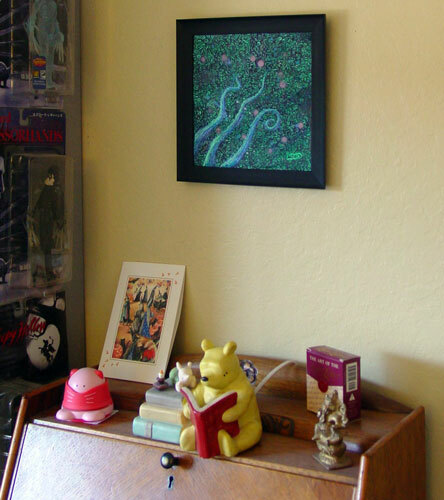 Below, I’ve slipped the piece into a frame, so you can see how it would look sitting on your desk. 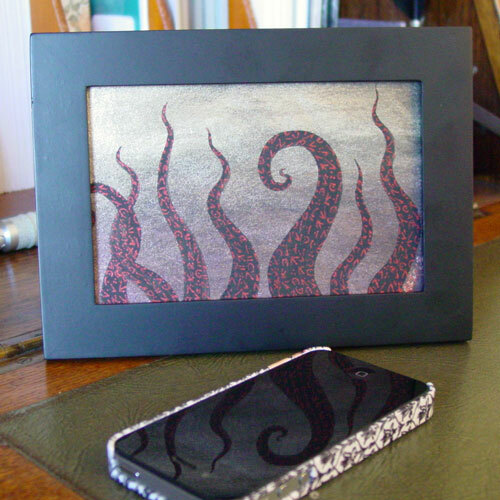 More tentacles! More shiny paint! It must be Tuesday. 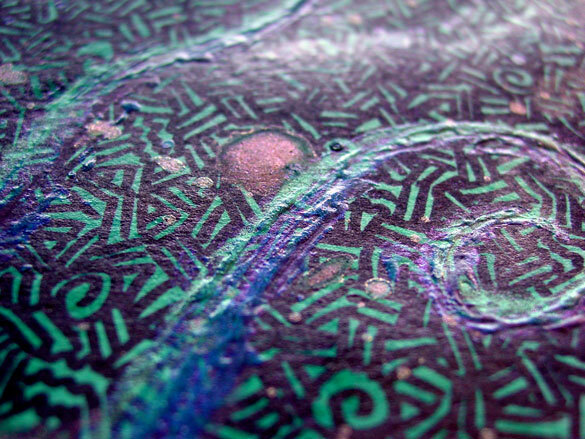 I used three different paints here with very subtle effects to the camera, but that are quite obvious to the naked eye. The first was the background in a green that blends into the green paper until the light shifts and it becomes a bright gold. 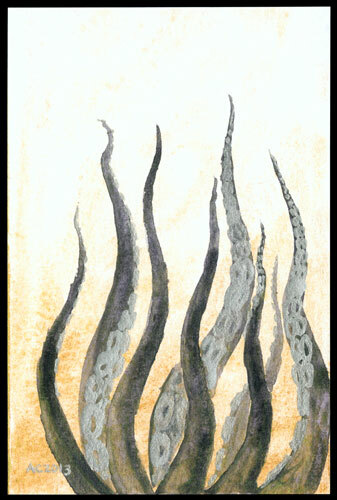 Then the tentacles are in two different shades that turn from green to bronze, different shades and different angles, but almost match. 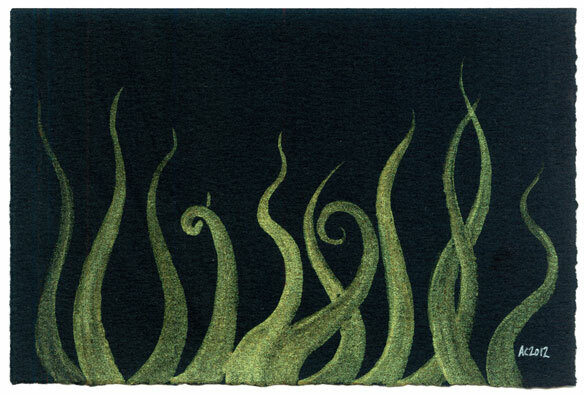 The overall effect is mysterious and ancient, hinting at tarnished bronzes or possibly green tentacles covered in iridescent slime as they rise up through the golden sunlight, seeking who knows what. 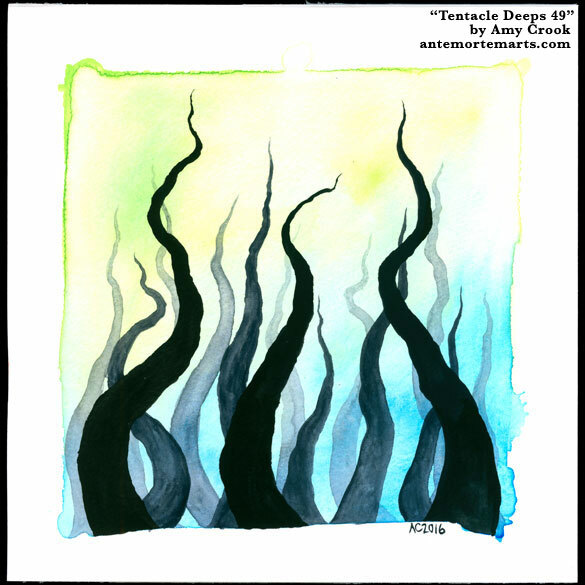 Tentacle Deeps 44, 4″x6″ duochrome watercolor on green Crane & Co. paper. 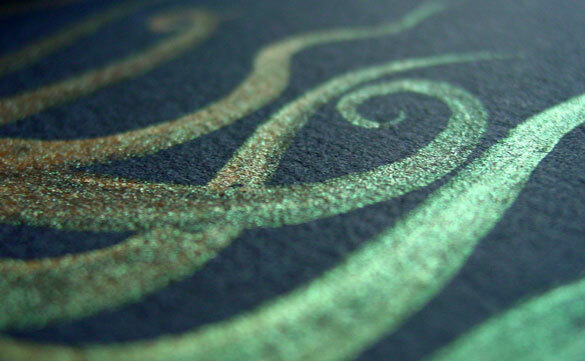 At most angles, I got the tentacles as all green or all bronze, but here you can see how the front layer is green and the back set bronze, and the background turns a warm, bright gold. 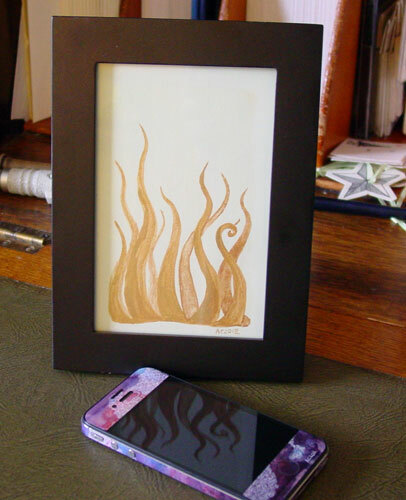 Below, you can see it in its frame, ready to grace your bookshelf, desk, or wall. Just when you thought it was safe to go back in the water(color)! 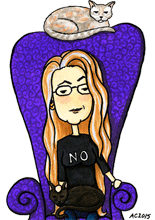 I never quite know when I’m going to be done with this series, but apparently it’s not just yet. 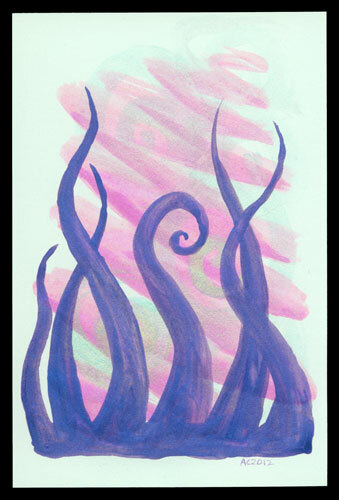 This is definitely another step in the girly direction for the tentacles, with shimmery purple, duochrome pink and green. Even the paper is a lovely soft green cardstock from Crane & Co. 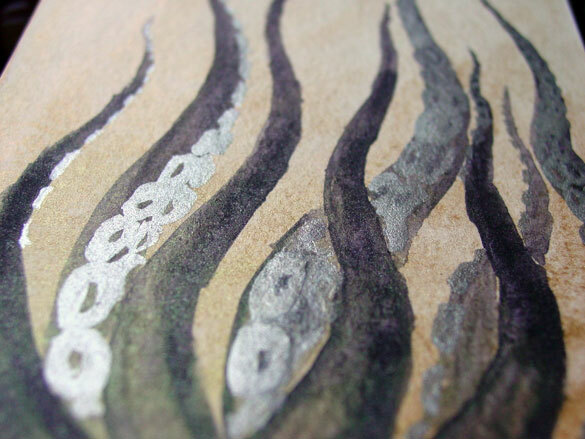 The spirals in the background are very subtle, the green-gold hard to see except in the right light, but I like the way they float up off the page like bubbles. 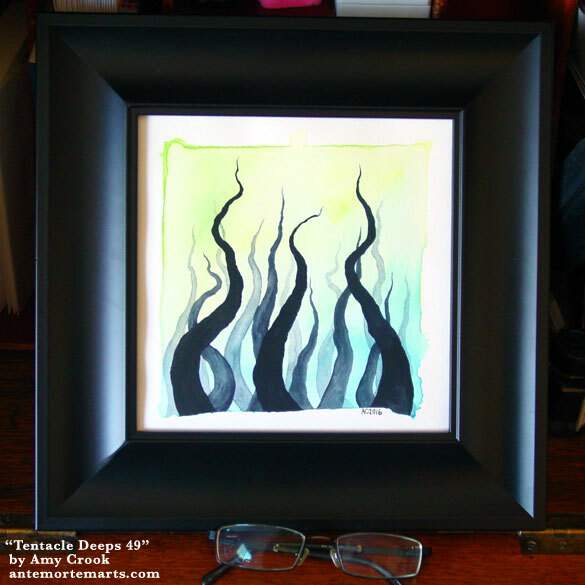 Tentacle Deeps 43, 4″x6″ iridescent and duochorome watercolor on green Crane & Co. paper. 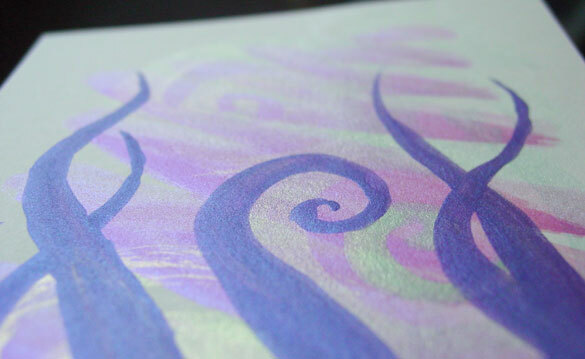 Above you can see the shimmer of purple in the pink, and gold in the green spirals, not to mention the sheen on the purple tentacles. 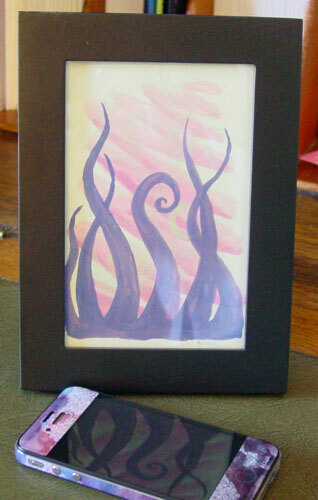 Below, it’s in its frame, waiting to bring a strange beauty to someone’s life.